I have always tried to eat as clean & naturally as possible. Inevitably we all go through phases (days, weeks, or more!) where we indulge a little in processed and/ or pre- prepared food. This may be because we ‘don’t have time’, convenience, or another excuse- or all of the above. However, I’m trying to make more effort into making healthy snacks in advance, rather than purchasing items like granola bars. Is it less convenient? I guess that depends on how much you enjoy food and the value you place on your long term health. More expensive? Maybe. We all have different priorities, but health & well being is one of mine. I will now step down from my soapbox, lol. 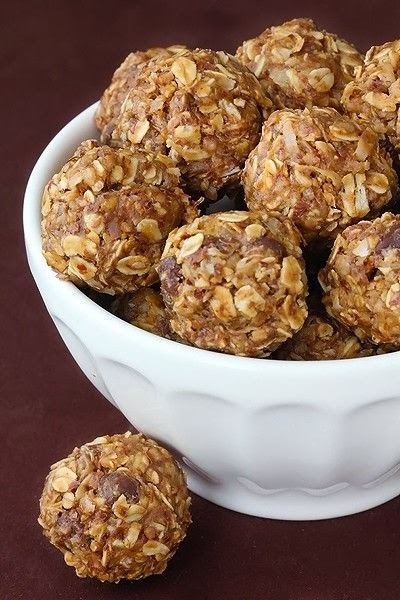 I recently made these bite sized goodies, and what’s great is they can be made at the beginning of the week & stored in the fridge for a yummy grab n go snack. When well mixed, scoop 1- 2 tbsp sized portions & roll into balls. Can be stored in fridge for a week. Yum! If you find they are still quite sticky for finger food, simply bring back to room temp & roll in shredded coconut to coat the stickiness.